Some astronauts have experienced eyesight problems after going to space, and a disruption in the body's cerebrospinal fluid could be the reason. 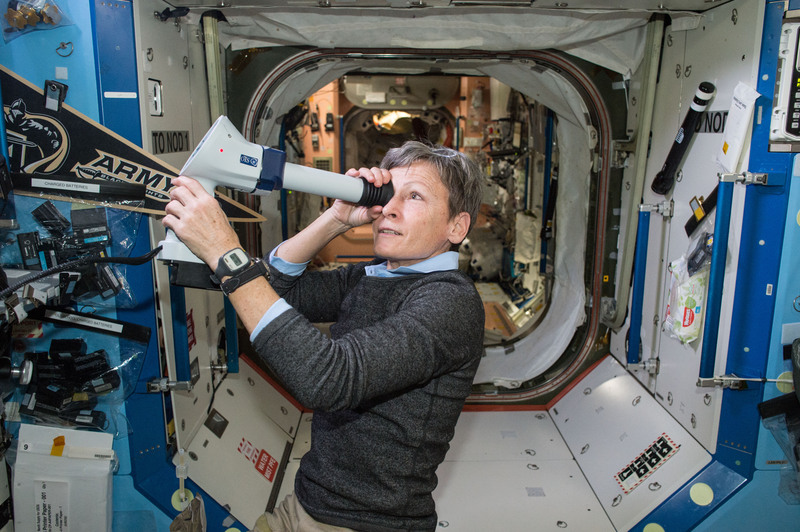 Many astronauts have experienced problems with their eyesight in during missions to the International Space Station and after their return, and NASA has been closely investigating the issue. It appears that changes to the brain in space could explain why this is happening. A new study in the New England Journal of Medicine sees changes in areas at the top of the brain that are filled with cerebrospinal fluid (CSF), as well as CSF in ventricles at the center of the brain. Out of 18 astronauts that flew in space for at least three months, 17 of them experienced a narrowing of the brain's central sulcus or groove. Some shorter-flight astronauts experienced the changes as well, 19 percent among a sample of 16 people. Some of the astronauts also had postflight MRI cine clip information available. These showed an upward shift of the brain for all 12 astronauts after long-duration flights; none of the short-duration flight participants (6 astronauts) experienced that. However, a narrowing of CSF spaces was seen after all long-duration flights (12 astronauts observed by MRI) and in one in six astronauts who underwent MRIs after short-duration flights. This points to the need to do more MRI tests on astronauts in the months and years after a spaceflight, instead of just immediately before and following a mission, says lead investigator Donna Roberts, a medical doctor and associate professor at the Medical University of South Carolina. "Ever since the advent of human spaceflight, NASA spent a lot of time focusing on what happens to the muscles and bone and heart, but it's only very recently that NASA has been interested in what's happening to the brain," Roberts told Seeker. That happened after astronauts began disclosing vision problems during long-duration spaceflights. Among the first astronauts to report it was former Canadian astronaut Bob Thirsk, who during a 2009 mission noticed that he couldn't read the eight-point-font stowage lists on the ISS. NASA launched an investigation and several astronauts have also reported problems in the decade since. But research has increasingly pointed to the role of CSF, which removes waste materials and moves around nutrients in the human body regardless of their position — standing up, sitting, lying down. That process may be disrupted in space. "On earth, the CSF system is built to accommodate these pressure changes, but in space the system is confused by the lack of the posture-related pressure changes," said Noam Alperin, a radiology and biomedical engineering professor at the University of Miami Miller School of Medicine in Miami, in a 2016 statement. Roberts's study shows that the brain's central sulcus — a groove near the top of the brain that separates the parietal and frontal lobes — can narrow in spaceflight (including, in fewer cases, in short-duration spaceflight) and also in healthy, voluntary long-term bedrest patients that were used as a control for the study. Long-term spaceflight astronauts also may have their brains shift upward (closer to the skull) and have the CSF-filled ventricle spaces in the brain narrow. "One of the main issues that is most concerning for me is the ventricles are getting larger over time; longer the astronauts are in space, the larger the ventricles become," she said. Because astronauts don't participate in MRIs for long after spaceflight, Roberts isn't sure if the ventricle problem is temporary or permanent. Another problem that generally hampers astronaut investigations are small study sizes, since only so many people get to fly to space. On Earth, a condition called idiopathic intracranial hypertension (IIH) presents similar problems to what astronauts experience: blurry vision and high intracranial pressure. IIH affects young, overweight women, and its cause is not well known. Astronauts, by contrast, tend to be middle-aged and in excellent shape; more of the corps is also male rather than female. The treatment for IIH is to drain the fluid using a needle placed in the lower back, which is a complex procedure performed by neuroradiologists. No equivalent of this procedure has yet been devised for space. Roberts said it's possible that research examining the brain changes of astronauts could benefit those with IIH, in that new treatments could be developed. Roberts is trying to get more medical records from astronauts, particularly those that stayed in space for particularly lengthy periods during one mission — like Scott Kelly (nearly a year) or Peggy Whitson (nearly 10 months). She is also participating as a researcher in a long-term bed rest study in Germany that exposes participants to higher levels of carbon dioxide, to simulate the levels that astronauts experience on the station. She urges the planners of Mars missions to examine human health and the brain carefully when planning human expeditions to the Red Planet. "It's important to develop the rockets and other technology," she said, "but it's also important to consider the human element to this." WATCH: How Do Astronauts Survive in Space?